Congratulations to Chickengirl for winning the book, The Apron Book! gymboree blanket on sale to make this Ottobre pattern romper for a friend’s new baby I got to make this t@ggie for a new baby boy in the family. She is my eldest’s piano teacher, thus the Kokopelli. 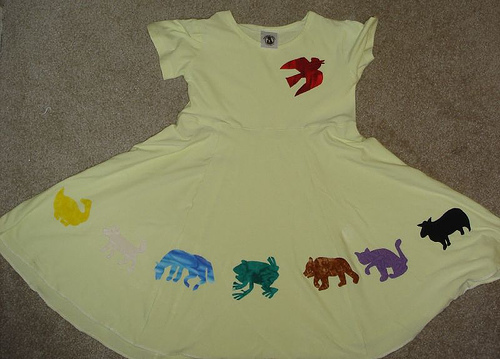 One of my most favorite things I did was this dress to match the book Brown Bear, Brown Bear What do you See? 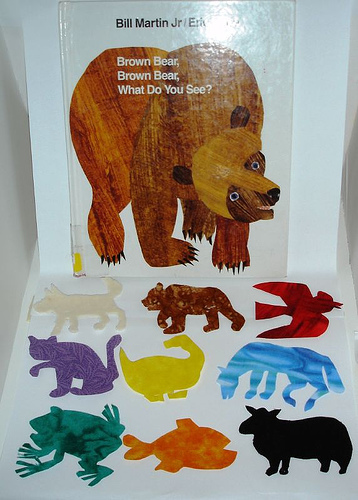 I found some great varigated cotton fabrics to use to cut out the characters from Brown Bear Brown Bear What do you Hear by Eric Carle. I made photocopies of the last page where all the animals are pictured for Mary’s dress, then used those for the templates. 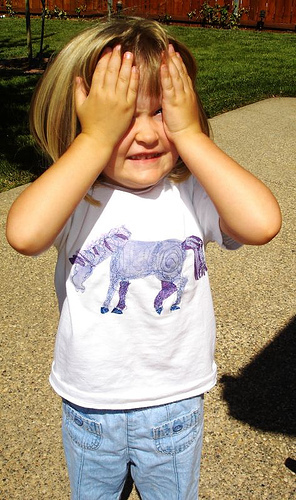 For lil’ sis, I created a purple horse from the same book. 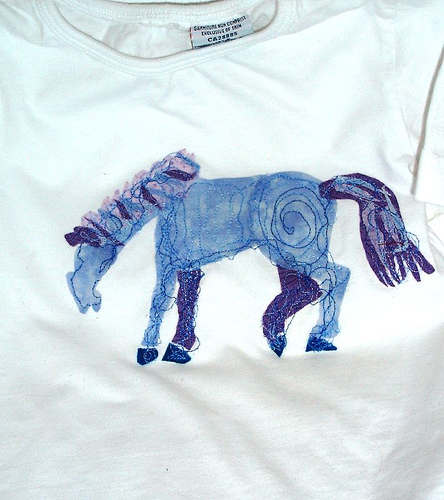 For the shirt, I photocopied the horse, and cut it apart like Eric Carle did in the book with paper. Then I used fast 2 fuse or some double sided sticky fusible stuff. I traced the outlines on the fabric (nothing special, just bits of wovens I had lying around) on different purples, trying to emulate the paintings Carle did. Then I ironed them on, and used my free motion embroidery settings and variegated thread to embellish. Time consuming but easy. Give: ASG and Wild Ginger worked together to create patterns for children and adults in wheelchairs and with other special dressig needs. Check out the free iCare patterns and sew some up for your local Shriner’s Hospital! The purpose of the iCare sewing patterns program is to provide custom-sized sewing patterns for hospital gowns, pajamas, and accessories for medical care. This program is provided free of charge to anyone who wishes to sew garments for non-profit and charitable purposes. Patterns printed from this program and garments made from these printed patterns may not, under any circumstances, be sold to anyone for any reason without express written permission from Wild Ginger Software, Inc. These patterns are the copyrighted property of Wild Ginger Software, Inc. 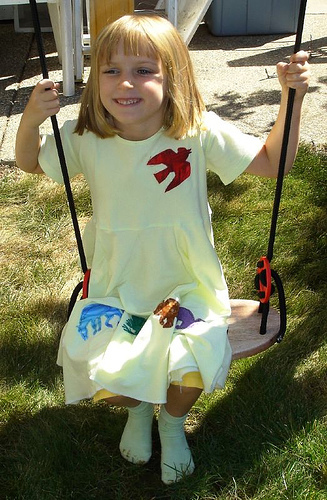 The iCare sewing patterns program is distributed under license by Wild Ginger Software, Inc. Installation and use of this program implies acceptance of the terms of this license. I’m reading and re-reading. Some are sewing related, some newbies, some are old friends. Worth a peek! I just found your podcast and love it. If you have time check out my new website http://www.fairyme.com/ By the way you have inspired me to try sewing a twirly dress for my daughters. Thoroughly enjoyed your chat with Marcie ….Just purchased her DVD’s. I am a member of Australian Sewing Guild. Marcie Tilton- that segment bought the ideas of her sewing/printing/wearing/loving it/living it. Going to replay hoping to get into podcast. Love your site thanks for some inspiration! Love Atwood too…Handmaid’s Tale is my favorite of hers!!! !